Meet women who are changing the face of the Roman Catholic priesthood and offering the church the gift of a renewed priestly ministry, rooted in Jesus' example of a discipleship of equals. Discover some of obstacles that the hierarchy put in the way of this prophetic movement. Church officials attempted to stop the ordination on the Danube in 2002 by trying to rent the boat the women had booked, but did not succeed because they were unable to get enough money. Get to know these pioneers as you read their stories of call and service to the people in grassroots communities in the United States, Canada, and Europe. All proceeds from the sale of the book go to Roman Catholic Womenpriests International to foster the movement around the world. This is a sad day when the hierarchy sends "spies" to the ordinations of womenpriests. This is behavior unbecoming of a follower of Christ, let alone the leadership of a diocese. Perhaps we should ask ourselves why the hierarchy is so threatened by womenpriests that they are willing to try to intimidate the Catholic Community in this manner. Rise up, People of God, and walk on water with us. Let us keep our eyes on Jesus and let the Holy Spirit guide us as we renew our beloved church in grassroots communities everywhere. A new day of Gospel equality has dawned for our church that gives hope to thousands, perhaps even millions who read about us or watch us on television! We the people are the church and God's holy people have nothing to fear! Press Conference: Saturday, July 19 th, 7:00pm in main ballroom at Hyatt Harborside Hotel, Boston Logan International airport. Contacts: Bridget Mary Meehan at 703-283-2929 or Eileen McCafferty DiFranco at 267-258-6966. Two hundred and thirty-two years ago, our American forefathers dreamed of a country where all men were created equal. That dream, of course, remained imperfect for many years while people of color were enslaved and all women were denied the right to vote and to hold office. The men who met in Boston and in Philadelphia preparing the way for the Declaration of Independence, the Constitution of the United States, and the Bill of Rights had compelling theological reasons to deny women – and people of color – the right to vote. God, they firmly believed, had made some people more ontologically equal than others. The time has finally arrived when Abigail Adams’ request to her husband John to “Remember the ladies” has come to fruition. The United States, like many other countries in the world, had at long last, a woman presidential candidate. Today, women in the Roman Catholic Church, invite the hierarchy to heed our foremother Abigail’s request to “Remember the ladies,” that is, fifty per cent of every congregation in every parish in the world. The Church of Jesus Christ in whom it is said that there is no male or female in Christ Jesus, has said repeatedly that it has no power to ordain women because the Lord God almighty, who made men and women in God’s very image, has tied their hands in this one particular issue. However, the church has been directed by Vatican II documents to develop a sense of history and to understand the sensus fidelium, the sense of the faithful. The last fifty years indicate that the Holy Spirit expects women to be treated as full partners in every respect in the world and in the church. Sixty-six per cent of the faithful have indicated that they would support women priests just as many Americans indicated that they were ready for a woman chief executive. Jesus founded a church that lives and breathes through the action of the Holy Spirit who constantly renews the face of the earth. Just as the status of women in many societies has changed, so the status of women in the church needs to change. The very health of the church depends upon a full acceptance of women into every level of church governance. It is a great moment for women in the Anglican Church. I applaud the decision by the governing body of the Church of England to allow women bishops. Unfortunately, the Vatican is critical, calling this action "a rift to the apostolic tradition." If we examine "our apostolic tradition" carefully, we will conclude that it is the Vatican that is out of step with Jesus and the apostolic tradition, not the Anglican Church! This statement by the Vatican contradicts its own scholarship. In 1976, The Vatican's Papal Commission concluded that there was no evidence in scripture that to prohibit women's ordination. There is plenty of evidence to support women as leaders, deacons, priests and ministers in the history of the early church. In fact, scholars tell us that women served in ordained ministry for the first 1200 years of the church's history. 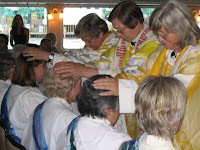 Roman Catholic Womenpriests, like our sisters and brothers in Anglican church, are reclaiming our ancient tradtion. Jesus called women and men to be disciples and equals and offered an example of Gospel equality for all Christians to embrace. Jesus called Mary of Magdala to be the apostle to the apostles! According to Luke 8, Mary of Magdala was one of the many women who followed Jesus and supported his ministry out of their resources. Read Luke 8 :1-3"With Jesus went the Twelve, as well as some women ... Mary of Magala, Joanna, the wife of Herod's steward Chuza, Suzanna, and many others who were contributing to the support of Jesus and the Twelve out of their own funds." Women were among Jesus' closest disciples and bankrolled his ministry. Jesus chose Mary of Magdala as the apostle to the apostles to announce the good news that Christ had risen from the dead. Jesus revealed his identity to the Samaritan woman and to Martha.The Samaritan woman was the first evangelist. She brought her whole town to Jesus. Mary and Martha were also friends and disciples. Martha's proclamation: "I have come to believe that you are the Messiah,God's only Begotten, the one who is coming into the world" (John:11:25-27) is similar to Peter's confession of faith in Mk 8:29. For the Johannine community this indicates that Martha possessed apostolic authority. In Romans 16:7, St. Paul called Junia and Andronicus outstanding apostles. In Romans, Paul commends deacon Phoebe as a leader and missionary in the church. It is time for the Vatican to stop discriminating against women and blaming God for it and follow the example of Jesus, the early church leaders and our sisters and brothers in the Anglican and other traditions who embrace women's ordination including women bishops. We in the Roman Catholic Womenpriests initiative are offering our church a renewed model of priestly ministry rooted in union with the people we serve in our grassroots communities in Europe, Canada, and the U.S. Bravo for the Anglican Church in creating another milestone on the journey toward women's full equality! "Saint Louis Sister of Charity Louise Lears was banned from archdiocesan ministries and from reception of the sacraments for her support of the right for women to be ordained in the Catholic Church. Now the Women’s Ordination Conference, which for more than three decades has pushed for the ordination of women, has begun a petition drive to overturn the edict of Archbishop Raymond Burke. " I encourage everyone to sign this petition to support Sr. Louise Lears, a woman of courage and witness to Christ's example of inclusivity, partnership and equality. May the people of God, rise up with Pentecost zeal to spread the Good News of the Gospel! Jesus showed us the way. Now, we the people of God, must reclaim our beloved church! A special thanks to the Women's Ordination Conference for leading the way by organizing this petition drive.